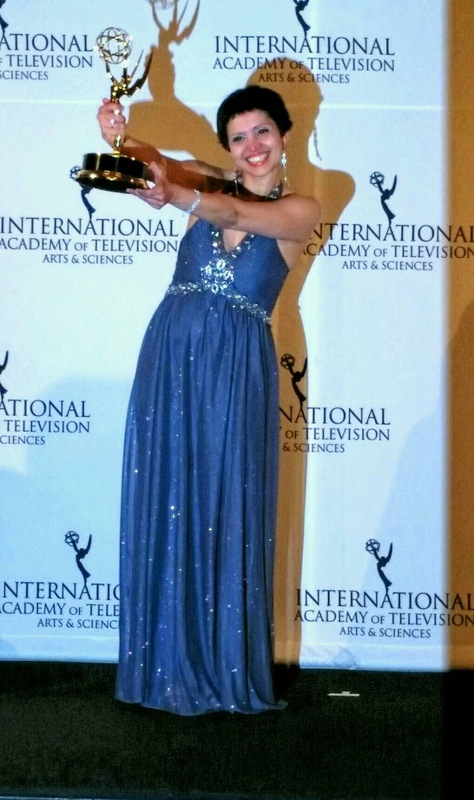 Maryam Ebrahimi, co-director of "No Burqas Behind Bars," shows off her International Emmy to the press corps at The International Emmy Awards ceremony on Monday night at NYC's Hilton Hotel. Photo by Mary Dunaway. THE usual level of grousing about the supremacy of the Brits at The International Emmy World Television Festival was markedly less intense this year. Instead, it was the documentaries that were creating lots of buzz during both the weekend festival and the Monday night awards program. The field was considered one of the strongest in the history of the festival. “It will be a long time before we will see such good work again," moderator and award-winning documentarian John Kastner remarked Saturday evening at the conclusion of a panel discussion in which representatives from all four nominated films participated. The presentation of the best documentary award came at about the midway point of The International Emmy Awards ceremony, heightening interest and further fraying some already frayed nerves. When the award was finally announced, the victor was “No Burqas Behind Bars” from Nima Sarvestani and Maryam Ebrahimi. A visibly shocked ME accepted the award for her film. It provides a glimpse into the experiences of several women serving time in an Afghan prison for “moral crimes.” (See video at right) … More shortly. Visit http://www.iemmys.tv/ to learn more about The International Emmy World Television Festival and and The International Emmy Awards, including the list of nominees and winners.